Way back when, D-Link came up with the idea of "gaming" routers, starting, I think, with the DGL-4300 back in 2005. The usual approach was to paint it black, throw in (or promote) a performance-based feature (it was a gigabit Ethernet switch in the DGL-4300) and re-skin the admin GUI, preferably also in black (and red). ASUS has pretty much stuck to this playbook with its gaming routers. The first grab for gamers' wallets was the RT-AC88U, a gamerized version of the RT-AC3100. Its chief claims to gamer fame were four extra ports, some red physical accents—antennas and heatsinks(! )—and the addition of support for AAA Internet Publishing's WTFast. 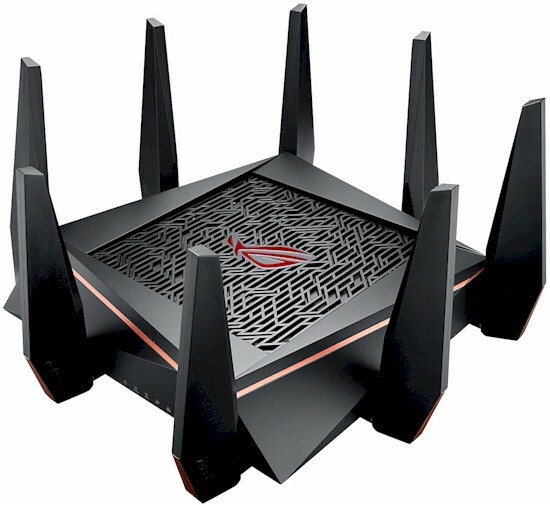 The ROG Rapture GT-AC5300 Wireless-AC5300 Tri-Band Gaming Router amps things up a bit more. The GT is part of ASUS' Republic of Gamers brand that includes laptops, desktops and computing accessories for those who like their gear to imply badass skilz. For about 40 bucks more than the RT-AC5300, the GT doubles flash and RAM size, doubles the number of gigabit LAN ports—adding 802.3ad link aggregation on two of them—and moves up to a quad-core processor from dual-core vs. the RT. The GT's admin GUI also has a gamer motif and throws in a few more gamer-bait features. Aside from the different logos on the top grille and connectors on rear panels, you'd have to look carefully to tell the GT and RT apart. Top and bottom venting for cooling is the same and the GT also lacks mounting screw slots. Gamers must not like indicator lights because the RT's set of tiny lights is carried forward to the GT. There is still only one indicator for all LAN ports. For the price and target audience, I'd expect link/activity lights on each port. Comparing to the RT's callout diagram below, we see the second USB port has been moved to the rear panel and it's USB 3.0, not 2.0. Note the GT's eight gigabit Ethernet ports include two ports marked Link aggregation and two marked Gaming. The information you see above is all the User Manual has to say about either. ASUS has added ridged rubber grommets around each antenna connector in an attempt, I suppose, to cure the RT's floppy antenna curse. These do no good, since the antenna body doesn't touch them. But the GT's antennas, which are taller and slimmer than the RT's, seem to have more rotation friction and didn't flop once during my time with the product. I was surprised to find the GT and RT have the same FCC ID (MSQ-RTGZ00), although they have significant differences on the inside. The FCC now apparently allows multiple hardware revisions to be registered under the same ID. The Class II change letter calls out three versions and references a test report. The table below, taken from page 5 of that report, shows four revisions, however. But the only version number marked on the product box or product serial number label is the Hardware revision, which is A. So I opened up the review sample to investigate, after testing was completed. Since ASUS advertises the GT as having a quad-core processor, that would mean it's either Rev 1.311 or Rev 1.411. The photo below clearly shows the GT board is marked 1.41. Heatsinks and RF can tops have been removed. The view below with the bottom cover removed shows more heatsinks. The general layout and construction is fairly close to that shown in the old FCC internal photos. The ASM1182e PCIe switch is no longer needed since the BCM4908 has enough PCIe ports built in to handle the three radios. All key components are summarized in Table 1 and compared to the RT-AC530. It looks like the Gaming (ports 1 & 2) and Link Aggregation (ports 5&6) connect to the BCM4908 and the others to the BCM53134 switch. The four antennas at the front of the box are shared between the 2.4 and 5 GHz low-band radios; the rear four connect only to the 5 GHz high-band radio. Note the BCM4366 is the "E" version. This is allegedly one of the revisions required to produce decent MU-MIMO. The radio test report in the 1/30/17 Class 2 change filings makes for interesting, although confusing, reading. It calls out seven different antenna sets, some of which have lower gain, according the the Class 2 letter. The antenna key diagram below from page 11 of the radio test report shows the 5 GHz high band (Channels 149-165), identified as "Band4", gets the rear four antennas to itself in the GT ("Version 2"), but shares the front four with the 2.4 GHz radio in the RT ("Version 1"). If you look at ASUS's feature comparison, you don't see much difference between the GT and RT. The GT supports link aggregation, while the RT doesn't. But both support Traffic Analyzer, Adaptive QoS, AiProtection and Parental controls. The comparison table is obviously flawed, since it makes no mention of WTFast and Game Private Network supported by both. The larger comparison omission is the GT's VPN support, which is the same as the RT's and includes both PPTP and OpenVPN servers and PPTP, L2TP and OpenVPN client. ...and Game Radar and Wi-Fi Radar menus. Game Radar shows ping times for popular game servers. But you can't change the Game list or server locations. Wi-Fi Radar contains tools commonly found in the many Wi-Fi scanning apps available. I give ASUS an "A" for effort, but an F for implementation. Each icon shown below takes you to a tab on the same screen. The screen shows only one radio at a time and is very long, requiring a lot of scrolling around. I homed in on Channel Statistics. The problem with all Wi-Fi troubleshooting apps to date is that they don't measure channel use. They can tell you how many APs are in range, channels they're on, signal strength, etc. But they can't tell you anything about the activity in each channel, i.e. how busy it is. Channel activity, not signal strength, is what you want to avoid in neighboring networks if you want maximum bandwidth. Unfortunately, ASUS does not appear to be measuring channel capacity, either. I ran a quick check by blasting traffic on Channel 40 on one 5 GHz radio and Channel 153 on the other, using 80 MHz bandwidth for each, which takes up four 20 MHz channels. The octoPal client reported channel congestion (use) in the 90% range for each channel. But Wi-Fi Radar said over 80% of the capacity in each channel was available! The bars below should all have been 10% or lower. The Advanced Troubleshooting tab supposedly offers plots of all the Wi-Fi statistics shown. Just the ability to see packet retries alone would be a huge help in troubleshooting Wi-Fi connection problems. ASUS clearly has more work to do here. The erroneous Channel Capacity "feature" is going to cause a lot of unnecessary confusion and frustration if people try to use it. The Router Charts graphs below show storage benchmark write and read results using our standard procedure with USB 3.0 connections and NTFS drive format, for the four products tested so far with the Revision 10 process. I made sure the Reducing USB 3.0 interference setting in the 2.4 GHz Wireless Professional settings tab and iTunes, DLNA and FTP servers were all disabled before running the tests. I even rechecked the RT-AC5300, running USB 3.0/NTFS tests only. There is obviously still something wrong with the RT-AC5300's USB 3.0 connection, given it yielded only 31 MB/s write and 34 MB/s read. But whatever's wrong with the RT has been solved with the GT, since it produces much higher throughput. The GT isn't best in class for storage performance, however. Switching to the Chart Revision 9 view shows Linksys' WRT3200ACM still claims the top spot, producing over 100 MB/s for both write and read. You can compare storage results between Revision 9 and 10 processes because the Storage test process hasn't changed. Our new Revision 10 process focuses on performance and includes tests for Bufferbloat and reduced throughput due primarily to Cut Through Forwarding being automatically disabled when particular routing features are enabled. If you haven't already, I suggest you read through the process description or even open it in another tab or window for reference while you read the commentary to follow. The GT was tested with 3.0.0.4.382_12184 firmware. The RT was upgraded to 3.0.0.4.380_7627 and had a full retest for routing and wireless performance. The WAN - LAN and LAN - WAN throughput benchmarks are the least meaningful, since most products can hit these numbers due to the common use of Cut Through Forwarding. But it's interesting that the GT with the more powerful processor has lower throughput measured in our WAN - LAN/LAN - WAN Throughput iperf3 tests. Both GT and RT did much better in our HTTP Score than the NETGEAR R7000 and R7000P. The legend obscures the 759 KB file size results, which were 99.4% and 99.9% for the RT and GT, respectively. You can see the GT also hit the 100% mark with the 108 KB file size. Both routers did pretty well with Bufferbloat. For reference, 5 ms of delay equals a score of 200 (1/5 x 1000) and higher numbers mean lower delay. Using that as reference, the GT's maximum upload bufferbloat was around 6 ms and its average was 4.4 ms. Finally, the Cut Through Forwarding tests showed the RT took more of a worst-case throughput hit than the GT. The biggest throughput drop was experienced by the RT, which ran at only 35% of its highest throughput on uplink when Adaptive QoS was enabled (941 Mbps to 333 Mbps). The GT's biggest throughput stealer responsible for the GT's 65% score was also adaptive QoS running uplink. It reduced normal uplink throughput of 713 Mbps down to 460 Mbps. But the GT's score was higher than it would have been, had its normal throughput been 941 Mbps instead of 713 Mbps. The GT-AC5300 and RT-AC5300 were tested with our Revision 10 wireless test process loaded with 3.0.0.4.382_12184 and 3.0.0.4.380_7627 firmware, respectively. Each router was reset to factory default after upgrade, then set to Channel 6 and 40 MHz bandwidth for 2.4 GHz and Channel 40 and 80 MHz bandwidth for the low band 5 GHz radio. The high band radio was set to Channel 153, but was not tested. WPA2/AES encryption was used for all connections. The Revision 10 process still uses 20 MHz bandwidth for 2.4 GHz tests for throughput vs. range, but uses 40 MHz for peak throughput tests. These settings are enforced by the octoPal test client. The router body was centered on the test chamber turntable with all antennas vertical as shown in the photo below. The 0° position for the router had the front facing the chamber antennas. Although you see four chamber antennas in the photo, only the center two are used for throughput vs. attenuation testing, which is done with the octoPal set to operate as a 2x2 AC device. The two antennas at photo left will be used in MU-MIMO testing, once that process gets sorted. Since four routers have now been tested with the Revision 10 process, I figured I'd throw them all into the throughput vs. attenuation plots for comparison. The 2.4 GHz downlink profile shows the GT with superior throughput with strong to medium signals. But as signals grow weaker with higher attenuation, the throughput lines converge. As a result the range rankings, which use the 45 dB attenuation value, all end up the same. 2.4 GHz uplink shows all products running in a very tight group. The main difference here is disconnect points, with both NETGEARs hanging on to their connection a bit longer than both ASUSes. 5 GHz downlink clearly shows the ASUS RT and GT performing essentially the same and both with better performance than both NETGEARs. 5 GHz uplink has a tighter race, with the ASUS GT on top, the RT and NETGEAR R7000P closely matched, then the original R7000 Nighthawk joining up from the 21 dB attenuation point onward. For our peak wireless performance tests, the octoPals are configured as 4x4 AC devices and left to negotiate their best connection, with 10 dB of attenuation applied on 2.4 GHz. The latter is necessary so the 2.4 GHz octoPal isn't overloaded. After some initial head-scratching over low throughput, I figured out the octoPal front end was being overloaded on 5 GHz too. So 10 dB of attenuation was also added for the 5 GHz tests. Since the octoPals report connection link rate, I saw 600 Mbps transmit and 800 Mbps receive link rates for both routers for the 2.4 GHz tests. For 5 GHz, 1733 Mbps link rates were the norm. These represent maximum rates for 256 QAM; the octoPal client does not support 1024 QAM. I didn't test MU-MIMO or Smart Connect. Although the GT-AC5300 now sits atop the Revision 10 Router Ranker, it's too early to award it a Ranked #1 performance award. That may come after I get a few more routers through the new process. For now, it's the top performing router tested with the new Revision 10 process. But it's also the most expensive, too. For best price/performance, just sort the table by ascending price and you'll find the NETGEAR R7000 takes that honor. Large, expensive single node routers are losing market share to multi-node systems. But investing almost $400 in a single router can still make sense for some users. That said, if you already have an ASUS RT-AC5300, you'd have to be really motivated to trade up to the GT-AC5300. While the GT has better storage throughput and won't lose as much wired routing throughput if you're using adaptive QoS, wireless performance is pretty much the same. You might notice higher 2.4 GHz speeds from the GT with strong signals, but you're not going to get significantly more range than you're already getting from the RT-AC5300. On the other hand, eight gigabit ports vs. four might be enough for some to justify spending the extra bucks for the GT.